To create a contact page with a contact form, there are a few key steps to follow. We like the Contact Form 7 plugin, but there are many others to choose from (i.e. Gravity Forms for a more advanced contact form). Once activated, you can adjust settings for your contact page by clicking on the "Contact" tab on your Dashboard's main menu. 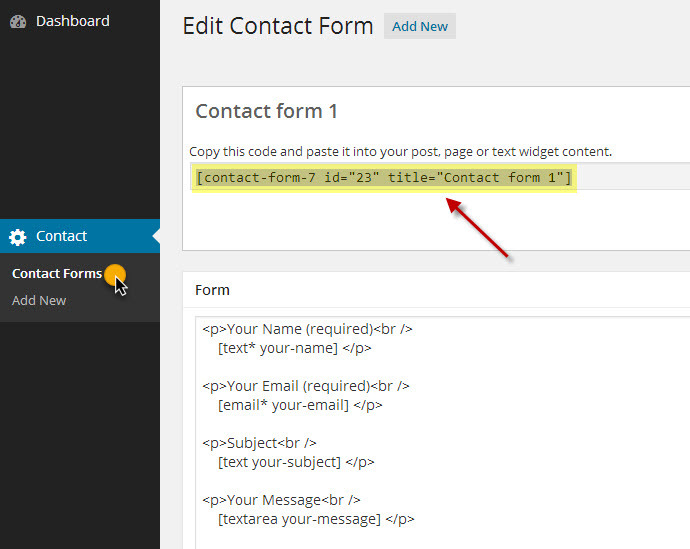 4) Copy / Paste the contact form short-code from the Contact Form 7 settings page into your Contact page. 5) Publish/Update your Contact page, and you should now have a fully functional contact page. NOTE: We do not provide support for Contact Form 7 or any other plugin. It is always best to contact plugin developers directly for precise instructions and support.